Welcome to St. Anthony's School! St. Anthony School is a Catholic community of students, parents and support staff working collaboratively to create a safe, caring, supportive, innovative and academically challenging environment for your child. This community fosters individual spiritual growth and self-esteem while promoting respect, understanding and appreciation across cultures. We also like to have fun! One of the goals of our program is to prepare students for a successful and rewarding future by developing their Catholic faith, academic and nonacademic skills. Therefore, we provide instruction in religion, language arts, mathematics, science, social studies, and physical education. In addition, there are visitors (parents and other community members), assemblies, field trips and other enrichment activities that enhance and enrich our classroom instruction. Respect for diversity and the ability to function effectively in different cultures are fundamental to our program. Students also participate in multicultural activities that are integrated into the classroom curriculum. The staff, parents, and students of St. Anthony School believe that our school allows the ability, flexibility, and latitude to provide innovative curriculum development and an outstanding instructional program. 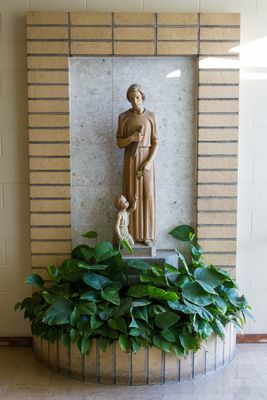 The exciting educational experience here at St. Anthony School reflects the wonderful relationship between the students, parents and school staff, as well as the surrounding community according to our Catholic faith. We are all partners for your child's success!